It's Celebration Series day and I have such a treat for y'all! Mattie is one of the most kind-hearted, genuine, selfless, passionate and talented women I've had the pleasure of, well, following on Instagram. Despite feeling as though we're real life besties, we've actually never met in person. Yes, that makes me sound creepy. And while I am a bit creepy, I honestly think it's just a testament to how authentic this girl is. And I mean truly authentic in the most non-icky-and-overused-on-social-media kind of way. 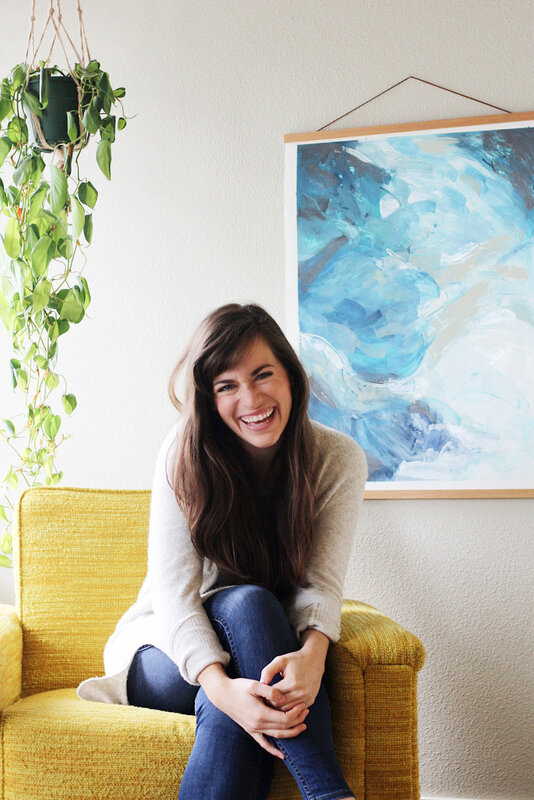 Mattie openly shares her triumphs, struggles, hopes, fears, and freakin' BEAUTIFUL work in a way that just makes you want to reach through the screen, give her a high five, and be her best friend. It's no wonder that she's in the business of helping creatives hone and communicate their stories with the world. Hello! I'm Mattie - a puppy snuggler, mountain lover, yoga do-er, margarita drinker, furniture re-arranger and graphic designer. I design custom business branding and websites for creative business owners and help them tell their stories truthfully and with confidence. I love people. Coincidently, most of my work is done alone in my studio and not physically alongside my clients. So, connecting with them before our project starts, getting to know their business story and their personal story, hearing their fears and excitements, offering encouragement and advice and helping plan a strong brand identity - one of the most important parts of running a business, I think - brings me immense joy. Oh, gosh. So, so much. I'm super inspired by setting and reaching goals that are completely unrelated to my work. I've been working for months on this certain yoga inversion, have committed myself to journaling every 2 or 3 days so our memories don't only live on my phone, and have vowed not to decorate our new home in one swoop but let blank space stay blank until we're sure of what should fill it. The more digestible answer: Trusting that we're exactly where we're supposed to be. That looking ahead in excitement is natural and okay, but our life is happening now. Over the past few years, I've realized that my creative talent is not what sets me apart. When I first began designing full time, that admission would have stung a little. I was striving so hard to be the best at what I was making. What I realize now is that creative talent is everywhere. Everyone is yelling about what they make and how they're better than the next guy. What makes me different is that I truly desire to love my clients well. I want to know them as a friend and be an advocate for their brand and mission. Strong design is important - yes - but because service is the root of my business, I chose last year to significantly limit the number of projects I take on each month so I can focus on walking closely with clients throughout the entire branding process and not just delivering a few design files and moving on. I co-host Gather Workshop, a seasonal creative conference in Atlanta, and one of the activities we do is explore our natural strengths and how those can help define our business models. My top two strengths are Relator and Developer. I find joy in close relationships, enjoy working alongside others to reach a meaningful goal, and recognize and cultivate potential in others. For so long I tried to be an achiever or a winner, but that's not who I am. There are other business owners who are killing it being the best in their industry or thrive on working on dozens of projects at once, but recognizing my natural tendencies has helped me serve my clients better and allows my business to be a true reflection of me. There's room in the creative industry for entrepreneurs with all different strengths. I think being honest about our own strengths frees us from comparison about how we're running our businesses. I'm a self-proclaimed sweets junkie. Mainly cheesecake, ice cream sandwiches, Oreos and Girl Scout Cookies (Savannah Smiles, the lemon ones that everyone forgets). My husband and I moved to Columbus, GA for a few months while he was doing some military training and I was coming home from Target (what else would I do in a new town?) and saw some Girl Scouts waving their signs from a gas station parking lot up ahead. Jackpot. I put on my blinker, crossed from the left lane to the middle lane and into the right turn lane approaching a stop light that was turning red. It was a corner gas station, so rather than turn right and then turn right again into the parking lot, I turned from the right turn lane into the gas station - efficiency, folks - via the entrance THAT WAS NOT THERE. I bumped and clunked and rattled over a (too high, in my opinion) curb into the gas station and rolled up to two very confused and slightly scared little girls. Let me be clear here. I drive a Jeep Grand Cherokee, not a Honda Civic, and I severely scraped all the other under-things and potentially popped a tire. For cookies. What an off-road adventure, right? A frazzled me paid $8 for two boxes of Savannah Smiles and ate the first box in the six minute drive home. I debated telling my husband the saga because duh, but I can't keep secrets so I spilled it. He shook his head (bless his heart for marrying me) and in all seriousness asked, "But where are my Thin Mints?" I feel like my very (physically and emotionally) rattled state should be an excuse, but apparently I should just be more aware of my surroundings. Mattie, thank you for sharing your work and your heart with us. You are such a light and inspiration for so many! If you'd like to creep on Mattie (like I do! ), you can find her on her website, instagram, facebook and pinterest.